The 11th Street Bridge Park has very exciting news to share regarding efforts to create DCs first elevated park over the Anacsotia River! Earlier this month the 11th Street Bridge Park received a $100,000 gift to support our nation-wide design competition, lead an economic development analysis and implement a health impact assessment. Now every donation will be matched dollar for dollar up to $100,000. To learn more about the project or make a donation, click here. Additional support can assist in funding the upcoming 11th Street Bridge Park design competition, a new civic space for active recreation, environmental education and the arts! via 11th Street Bridge Park Receives Matching Gift | THEARC. 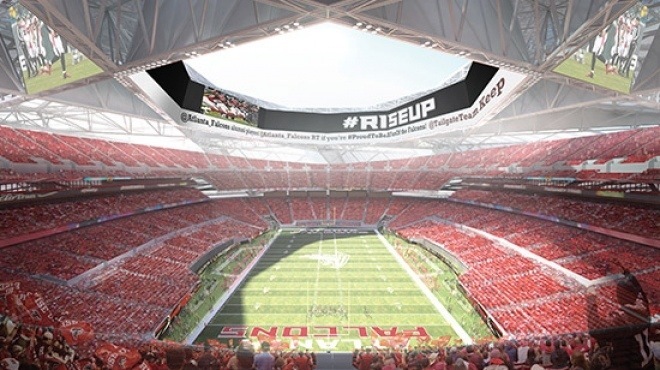 ATLANTA (June 14, 2013) – The Atlanta Falcons announced today that 360 Architecture has selected three Atlanta-based firms, pending final contracts, to partner in the design of the new stadium in Atlanta. The three firms – Goode Van Slyke Architecture (GVSA), Stanley Beaman & Sears, and tvsdesign – each bring unique skills to the table. Buses, trams, bicycles, pedestrians, and cars zoom about modern cities like blood pulsing through the body. But with urban growth comes challenges—one of them is how to improve transportation. Luckily, advances in technology combined with active open data and open source movements mean the citizenry can increasingly become part of the solution. Unclog the arteries, stimulate circulation. The Urban Data Challenge seeks to harvest the innovative and creative power of communities around the world to explore urban data sets through visualization. via Urban Data Challenge: Zürich | San Francisco | Geneva | Urban Prototyping. If you’re feeling curious, take a poll of your friends and ask them what U.S. city is the most exciting. We’re willing to bet that the majority of them will come back to you with the same answer: New York City. The Big Apple. The City That Never Sleeps. There are more than enough reasons to support this notion. New York City is large and crammed with people and things to do. In fact, most of the Movoto bloggers thought that New York City was, if not the most exciting, definitely one of the most exciting places to be in America. via The 10 Most Exciting Cities in America.